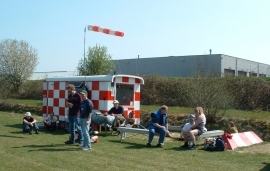 The VCH is a gliding club located at Hoogeveen Airport (EHHO), the Netherlands. Guests are welcome to have a look or to fly with us. We fly from March 1st till the end of October, everyday except Tuesdays and Thursdays, from 10:00 AM until sunset. Usually the gliders are launched by aerotow, and occasionally in the early morning or in the evening we pull out our winch. Introduction flight (Introductievlucht): Aerotow to an altitude of 600 meter in a double seated glider (ASK-21 or DG-1000T) with an experienced glider pilot. Flight time is at least 20 minutes, price 50 euro. Should you join our club, part of the amount will be returned. To make sure this website remains up to date, please refer to the Tarieven page for prices, in Euros. It is advisable to call our cellphone +31 (0) 654 962 669 around 10:00 AM or later to check for activity. The easiest way to come to the airfield is by car, see this page for directions. Hoogeveen does have a railway station but it is a 35 minute hike to the airfield. For general information, please contact the club via the secretary's e-mail or telephone on the contact page.